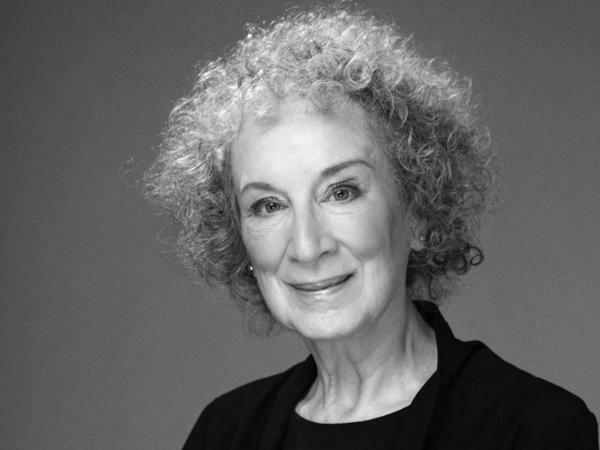 Canadian Margaret Atwood is the author of more than a dozen novels including The Handmaid's Tale, The Blind Assassin and Oryx and Crake, as well as works of poetry and nonfiction. Author Margaret Atwood is prolific, beloved and extraordinarily accomplished. In addition to best-selling novels like The Handmaid's Tale and The Blind Assassin, she's penned poems, short stories, children's books, essays and works that defy classification. But her fans will have to wait a long, long time for one particular piece of writing. She's working on a book that nobody will read for a hundred years — part of an art project that's going to require some special archival paper, as she explains to NPR's Arun Rath. In the meantime, readers can pick up her latest work, Stone Mattress. It's a collection of what Rath calls "wonderfully weird short stories," in which the passage of time plays a key role. Many characters find that they're powerfully affected by things that happened years ago, in their youth. "It does seem to be a human characteristic, that in fact those things, although you may forget about them in your 20s, they are the sub-layer upon which your life is based. And they come back," Atwood says, warning Rath that the same thing will happen to him as he ages. In most of NPR's author interviews, the host asks the questions and the writer responds. But, as Atwood tells Rath, "there are no rules." Click on the audio link above to hear her turn the tables, quizzing Rath about his commitment to Comic-Con and asking whether he feels caught in traps of his own making. It becomes more real to her and more important to her because it's an escape from her actual life. And talk to any writer on that subject ... that's just a characteristic of writing, not a characteristic of fantasy writing. She's got her old boyfriend in a barrel ... and she's got her old rival for that very boyfriend shut up in a stone wall and attacked by bees. So she's acting out, but in a way that doesn't actually harm the real people — or so we believe. The artist is a very inventive young lady called Katie Paterson, and her idea is that they're growing a forest in Norway and it will grow for a hundred years. Does this recall Sleeping Beauty to your mind? And each one of those hundred years, they will invite one writer to write a manuscript. It can be anything — it can be a novel, a poem, nonfiction. And all that can be told about it is its title. So each one of those hundred years, a manuscript will be presented and put into this room in the [New Oslo Public] library, in a box, sealed, like a genie in a bottle. And at the end of the hundred years, they will cut enough trees from the forest to make enough paper to print the book of these books — of all of the manuscripts that have been put in the boxes. There's a number of very attractive things about it. First of all, I will not have to deal with the critics. Think of that. Second, it is a lot like the message-in-the-bottle metaphor for writing any book. Any book that you write, you write it and then you publish it — that's the bottle part. And it goes out on the sea of wherever books go, flows hither and thither, and you don't know who may read it. So this is the same, except that there's a hundred-year gap. As the writer, you will never know what people think of it. This is ALL THINGS CONSIDERED from NPR West. I'm Arun Rath. It's hard to imagine a living writer more accomplished than Margaret Atwood - novels, poems, short stories, children's books, essays and works that defy classification. She's distinguished herself in every possible way. Margaret Atwood is somehow able to write fantastic tales that are deeply literary and infused with a brilliant sense of humor. At 74 years old, her wit is as sharp as ever. MARGARET ATWOOD: When you're writing fiction, everybody thinks you're secretly writing about real people and things. But if you write an autobiography, they think you're lying as one does. RATH: Atwood's latest book is a collection of wonderfully weird short stories. When we spoke I asked read part of the title story, "Stone Mattress." I'll just set it up - there's an older woman who's gone on a cruise and she happens by chance to encounter the man who had raped her when she was a young woman. ATWOOD: And he doesn't recognize her. ATWOOD: (Laughter) But she recognizes him. The next morning, during the chartered flight north to where the ship is floating on the Beaufort Sea, she considers her choices. She could play Bob like a fish right up until the final moment, then leave him cold with his pants around his ankles. A satisfaction, but a minor one. She could avoid him throughout the trip and leave the equation where it's been for the past 50-some years, unresolved, or she could kill him. RATH: And she goes for option three. ATWOOD: ...Where it says at the outset, she didn't intend to kill anyone. So you think well (laughter) that was at the outset. RATH: It's interesting about these characters, it's really striking about all of them, is how they're in the later part of their lives, but they're really still so deeply affected by what happened in their youth. ATWOOD: And you will be too. ATWOOD: Yes, it does seem to be a human characteristic that, in fact, those things - although you may forget about them in your 20s - they are the sub-layer upon which your life is based. And they come back. RATH: You know, although not many of us get the chance to address them so intimately, or in the case of this character so violently. RATH: You have a character in this book, it's from the first three stories in this collection, they're interconnected. And in the first story, you have an aging writer who's created this fantasy world. And it's kind of - kind of B literature sort of by her own reckoning, this place called Alphinland. But it becomes more real to her - more important to her over time. ATWOOD: Well, it becomes more real to her and more important to her because it's an escape from her actual life. And talk to any writer on that subject. But she starts her series for pulp magazines back in the early '60s, before any of this kind of writing had a cachet. So think of a world without comic-con. You know, it didn't exist back then. And people wrote these things for the pulps under different names because you didn't want to have the same writer all the time. ATWOOD: You wouldn't want - let's examine that - you wouldn't want to be in a world without comic-con. That's a pretty firm commitment. RATH: It is. I'll stand by that. ATWOOD: Well, I would not want to be in a world in which people didn't dress up from time to time. It would be very boring. RATH: Right. Is there - in this character Constance in "Alphinland" - I just wonder reading about her in this world that she's created, is it a fear for a writer like yourself who has done so much writing that, in a way, you become trapped by what you've created? ATWOOD: How old are you? ATWOOD: Oh, do you feel trapped by anything yet? RATH: (Laughter) I feel trapped by a lot of things. ATWOOD: Are any of them of your own creation? RATH: Well, that's kind of deep. ATWOOD: It is. It's quite deep, isn't it? Yes. Well, that was the question you asked me. RATH: Yeah, I would - but I'm supposed to ask the questions. I'm not supposed to reflect on myself. ATWOOD: There are no rules. In "Alphinland," we make up our own rules. ATWOOD: Ok, let's put it another way. In "Alphinland," Constance has got a couple of other people trapped in there. ATWOOD: For instance, she's got her old boyfriend in a barrel in a (unintelligible) wine facility. And she's got her old rival for that very boyfriend shut up in a stone wall and attacked by bees. So she's acting out, but in a way that doesn't actually harm the real people, or so we believe. RATH: I read that you're working on a book that won't be read for 100 years - intentionally - something that's called The Future Library project. ATWOOD: Isn't that good? So I was approached by the Norwegian Library of the Future. It's called the Future Library. They're building the building - the new library - and in that new library, there's going to be a room. And they're growing a forest in Norway and it will grow for 100 years. Does this recall "Sleeping Beauty" to your mind? And each one of those 100 years, they will invite one writer to write a manuscript. It can be anything. It can be a novel, a poem, nonfiction. And all that can be told about it is its title. So each one of those hundred years, the manuscript will be presented and put into this room in the library in a box - sealed like a genie in a bottle. And at the end of the 100 years, they will cut enough trees from the forest to make enough paper to print the book of these books, of all of the manuscripts that have been put in the boxes. RATH: See you agreed to do this, so obviously there's something about this you find attractive, or at least intriguing. ATWOOD: There's a number of very attractive things about it. First of all, I will not have to deal with the critics. Think of that. Second, it is a lot like the message-in-the-bottle metaphor for writing any book. So any book that you write, you write it and then you publish it - that's the bottle part - and it goes out on the sea of wherever books go. It flows hither and thither and you don't know who may read it. So this is the same, except that there's a 100-year gap. As the writer, you will never know what people think of it. You will also never know whether they understand it because the language may have changed in that time. Being a practical person, I did think immediately I will have to get archival paper and non-fade ink or else they might open the box and find nothing in it. RATH: That's Margaret Atwood. Her new book of short stories is called "Stone Mattress." It's out on Tuesday. Margaret, it was great fun speaking with you. Thank you. ATWOOD: Lovely speaking with you. Transcript provided by NPR, Copyright NPR.